Would you consider yourself a “snacker?” I am. And for some reason, this has a bad connotation. For me, it simply means I eat balanced mini-meals, made up of simple real foods, between my larger meals. Generally it’s fruit and cheese, a hard-boiled egg, a yogurt, roasted chickpeas, or something similar. It’s not “snacky foods” like candy, cookies, crackers or chips. No, they’re not. However, they work well for me and many of my clients in terms of acheiving a healthy weight, maintaining good energy, and feeling satisfied with foods. 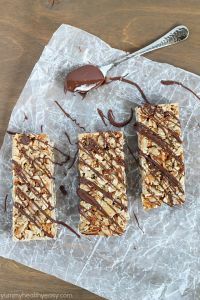 Here’s a good Power Protein snack bar recipe, and my guide to being a Healthy Snacker. Combine first 6 ingredients in a large bowl and mix well. Line a 9×13 inch baking dish with parchment paper. Place mixture in dishand spread to all edges. Place another sheet of parchment paper on top of the mixture. Press it firmly down with a heavy object like a large tomato can, cast-iron skillet, or rolling pin – really! Pull off top parchment paper (save for later) and bake in the preheated oven for 12 minutes. When the bars are finished baking, take out of the oven and again press them with parchment and heavy object. Mix melted chocolate chips and coconut oil together. Drizzle melted chocolate mixture over bars. Place in refrigerator at least 30 minutes to cool. Cut into 12-18 bars. Store bars in the refrigerator. Enjoy! Ever heard of “hangry?” That’s me without snacks. It’s an individual choice and plan – I do better with small meals and snacks and those around me thank me for it. I’m generally on the go (4 kids and 2 businesses) and I don’t often get much time to sit for daytime meals. So, smaller meals and snacks between work for my schedule. I enjoy foods like fruits, yogurts, vegetables, and more. Snacks are an opportunity to nourish my body…it’s not always about minimizing foods, but getting what your body needs as daily fuel. Set aside a time to eat and then be done with it. Allow time for your stomach to empty and you to feel hungry again. This process is a natural part of digestion and hormone function. If you always feel full, you’re likely eating too much or too often. Keep your snacks full of proteins, healthy fats, vegetables, and small amounts of whole foods carbohydrates – but not all at once. Keep it simple. A single-ingredient real food is usually your best bet. Guess what’s in an apple? An apple. If baking snacks (like the recipe above), be very cautious. Baked goods, while delicious and fun, can be a huge source of refined carbohydrates, sugars, and calories. They are often saboteurs for weight loss. Don’t overdue it. If trying to lose weight or maintain a lean one, usually 150 calories, or for higher-calorie plans, 200 will work. Don’t allow sugars and refined carbs to sneak in. Take the junk-food out of snacking. Don’t graze. You should not always be eating. Don’t think you have to snack, you don’t. In fact, some people do much better with only meals. This week, consider swapping out any junk-food snacks for better choices. Pick a single-ingredient whole-food, healthy recipe like this one, or healthy commercial option (Kind Strong Bars, for example). If you prefer the no-snack approach, make sure to eat good, healthy daytime meals to nourish yourself. Choose wisely, stay energized and keep on pedaling! These look delicious. Reading through this article, I’m interested in what you think .. I am a 28 year old female cyclist, 5’10.5” and 132-134 pounds. I generally ride about 280-320 miles per week or about 16-19 hrs/week. I feel like since I have been maintaining this training load, I want to snack all the time! I just moved to arizona, and so I started doing all of my rides in the morning, while previously I had ridden in the afternoons/evenings. It seems like I am eating more now, but that could also be because I’ve increased my training load the last 6 weeks. How many calories would you recommend eating a day for what i’ve described? I’d love to hear your thoughts!